A Las Vegas team met at a hackerspace in downtown Las Vegas to launch a do-it-yourself Delta Robot kit that’s fun to build, sharp to look at, and a great point of departure for your own robotics project. After launching on Kickstarter, the project was successfully funded on March 3, 2014 by 289 backers pledging over $25,000. Around the time she started prototyping the delta robot design for the project, she met Mark Koch at a SYN Shop meetup. Mark Koch is a Las Vegas native and 20 year veteran of Silicon Valley who is interested in electronics, robotics, micro controllers, coding, hacking. He is also co-founder of SYN Shop, the Las Vegas Hackerspace. 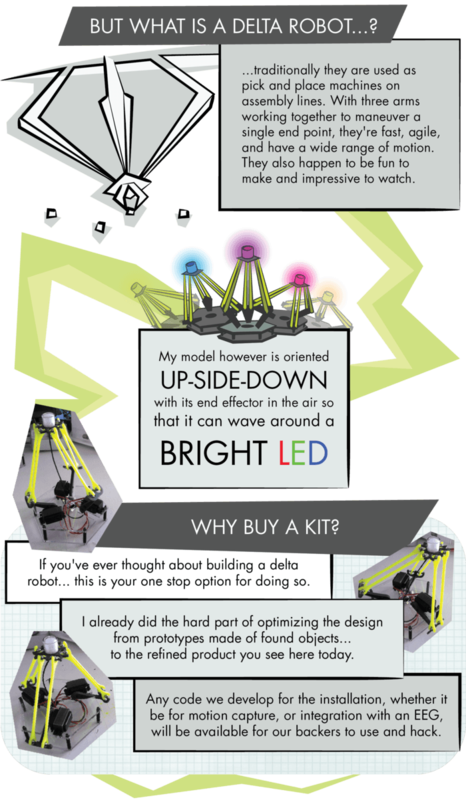 “Mark had always wanted to make a delta robot of his own, so we immediately hit it off and started working in tandem on our own separate projects. Over time our efforts bled together and we decided to prepare a Kickstarter back in October of last year,” said Sarah Petkus. “By deploying our delta minions out all over the world, we are hoping to create a sense of ownership and community around the project that will continue beyond the lifespan of the art installation,” said co-founder Mark Koch. “What Mark and I have in common is that we both love the challenge of designing something better than anyone else has. Since we met, we’ve had a friendly competition over who can build a better robot; him with his mad engineering background… or me with my artistic repertoire,” Sarah Petkus said. Sarah Petkus and Mark Koch say one of the most challenging things about the Kickstarter experience was shamelessly advertising the project. The duo said it was also tricky to gauge and anticipate the scope of fulfillment for the campaign. They had accounted for a small volume production, but there was still the chance that they would overshoot their own expectations and sell thousands of kits. “The last thing we wanted was to have a ton of money and no idea how to go about spending it properly,” said Mark Koch. The Robot Army LLC team advises teams on Kickstarter to look up the rates on international shipping, as it is more expensive to send things out of the United States than it is for the rest of the world to send things here. Because of how the duo approached the Kickstarter campaign, they say they decided to start Robot Army LLC and have since established a brand. “We enjoyed bringing our first model to market so much that we’re already scheming about repeating the whole process again this winter with a new kit,” said Sarah Petkus. Sarah Petkus and Mark Koch invite the #VegasTech community to come see their collective in person once it starts making its way around town. “Also, if you want to adopt a neon yellow robot of your own, we are still taking pre-orders on our website,” Mark Koch adds. 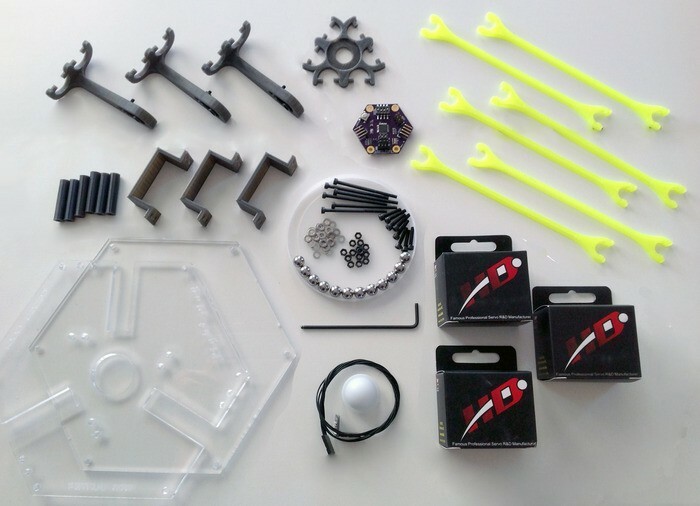 About SYN Shop: SYN Shop is a hackerspace located in Las Vegas, Nevada. It is a space for sharing, creation, collaboration, research, development, mentoring, and of course, learning. Our motto is: “Let’s make stuff awesome!” SYN Shop was started back in 2008, when a bunch of DIY enthusiasts decided that instead of hiding in our garages, workshops and offices, we should instead come together and start a community around the things we are passionate about.